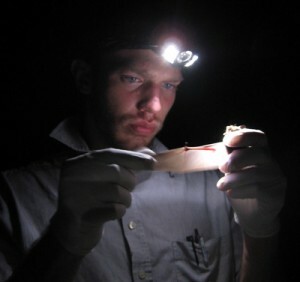 In research, published in the Journal Plos ONE on Wednesday, scientists at the University of California in Santa Cruz, isolated bacteria from the skin of four bat species and tested the isolates for their ability to inhibit the growth of the fungus. Six bacterial isolates, all in the genus Pseudomonas, showed promise and were tested more extensively. As luck would have it, all six specimens were found to significantly inhibit growth of the fungus, and two isolates performed especially well in suppressing fungal growth for more than 35 days. Experiments are now in progress to see if applying the bacteria to bats can protect them from the disease. The hope is that a bacterial spray applied to bats during hibernation could suppress the fungus enough to help the bats survive the winter. Curiously, the isolates with the strongest inhibitory properties were cultured from a bat species that has suffered lower mortality from white-nose syndrome than other species. It raises the possibility that naturally occurring bacteria might have something to do with the lower impact of the disease on some species.